The Cuban In My Coffee: DIY Gilded Gold Pendant Light, Black And Gold....Bling! 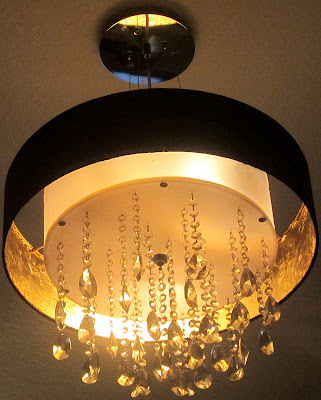 DIY Gilded Gold Pendant Light, Black And Gold....Bling! 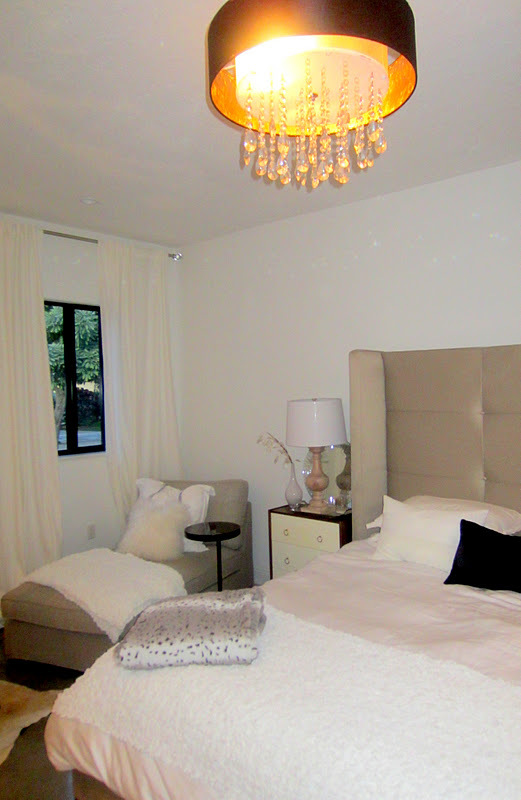 I wanted to share with you the lighting progress for our master bedroom. Originally I wanted to go with the grey and white theme that I loooove. 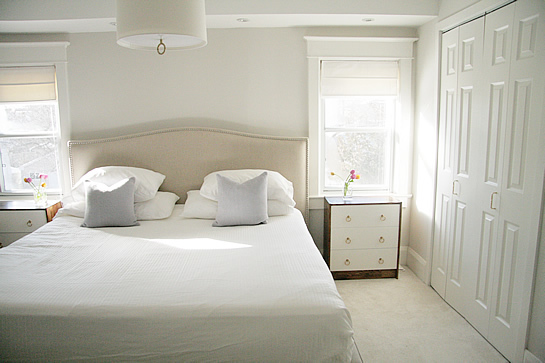 Here is the original inspiration below from Aubrey + Lindsay's Blog mostly because I already had a similar bed and the palette was a great transition. Oh, and yes I did hack those RAST night stands! I already told you that I added black in to the mix of colors which spiced things up nicely. 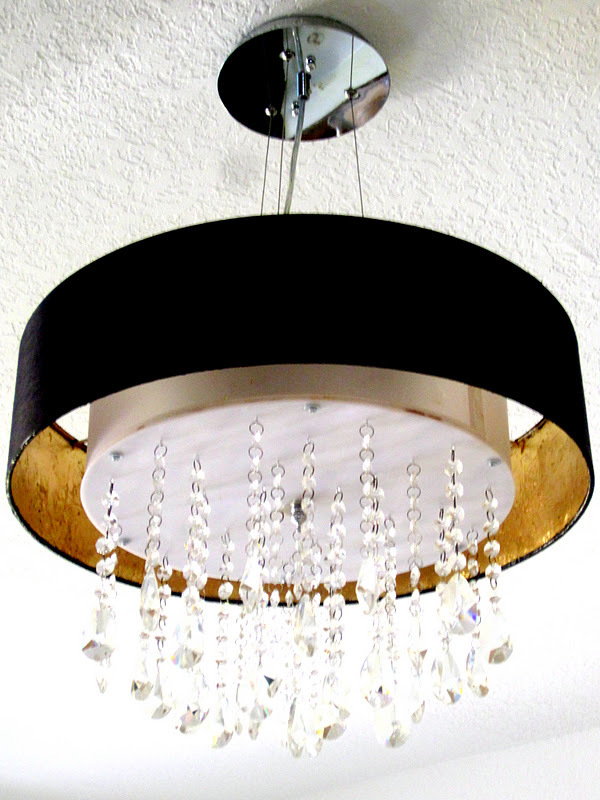 My new lighting inspiration came from Haute Khuuture's blog from an Ikea hack where she gold leafed a black KULA drum light as seen below. This is exactly what I needed to push things off. 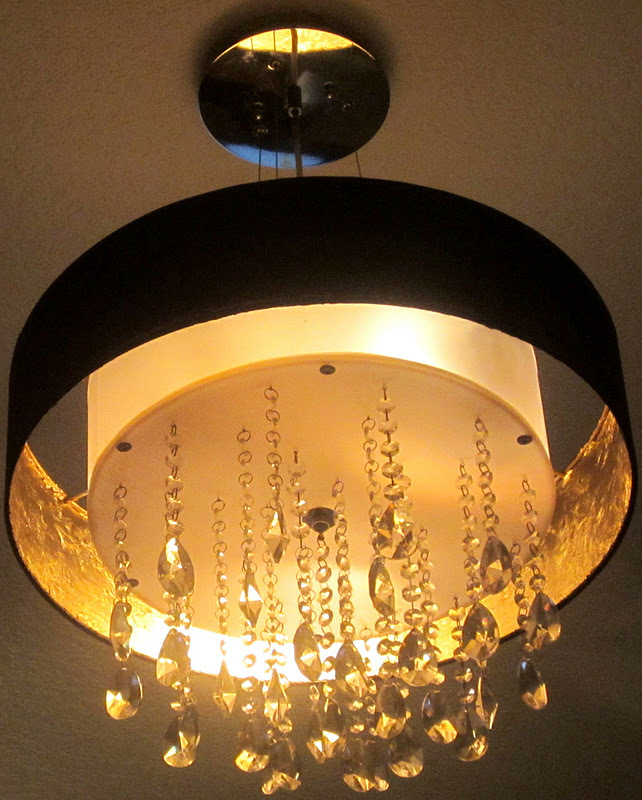 Now I didn't use the same light fixture, simply the idea of adding the gold to one. Mine started with this Portfolio 23" Chrome Millbrook Pendant Light With Black Linen Shade for only $169 from Lowes. 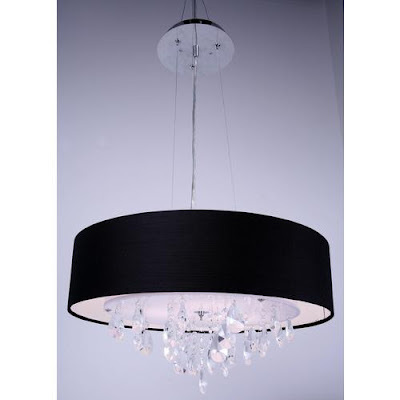 It has the makings of a really nice light and I LOVE the fact that it has crystals hanging from it. I bought the gold leaf and the 24k gold spray paint both from Michael's. I didn't take a picture of the gold leaf, but it is sold in sheets and I bought 2 packs. 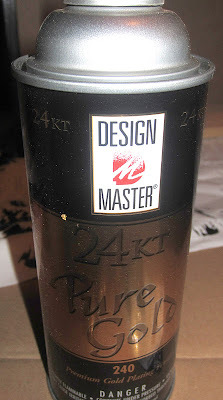 The spray paint is Design Master 24KT Pure Gold (and will also be used later in my IKEA RAST night stand re-makeover coming soon) shown below. For the adhesive I used a clear spray adhesive, and a small foam brush which did me no good because it got tacky from the adhesive and actually started pulling the gold leafing off my light. WTF! 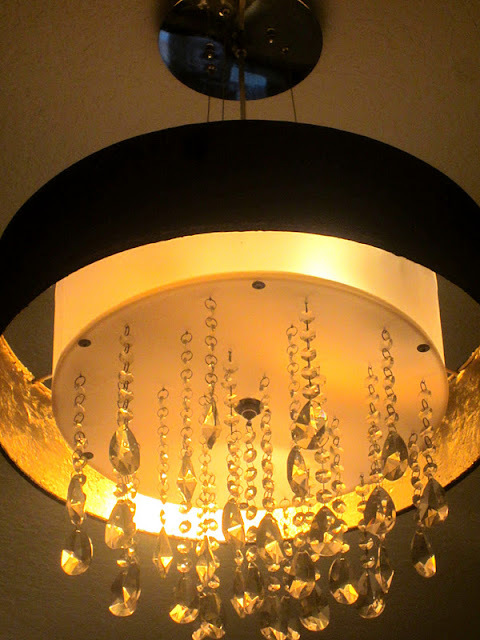 Now let me start by saying that this project SEEMED simple, but IT WAS NOT SIMPLE! It was worth it, but it was much more complicated than I originally anticipated. Here's what I did and what I should have done;) Trial and error baby, trial and error. 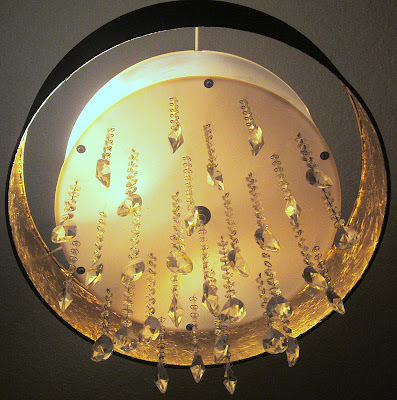 * For those of you who want to try this and should you choose to use this same light, take my advice and cover the inside drum which is a white plastic with some tape and paper to prevent the gold leaf or spray paint from getting on anything. 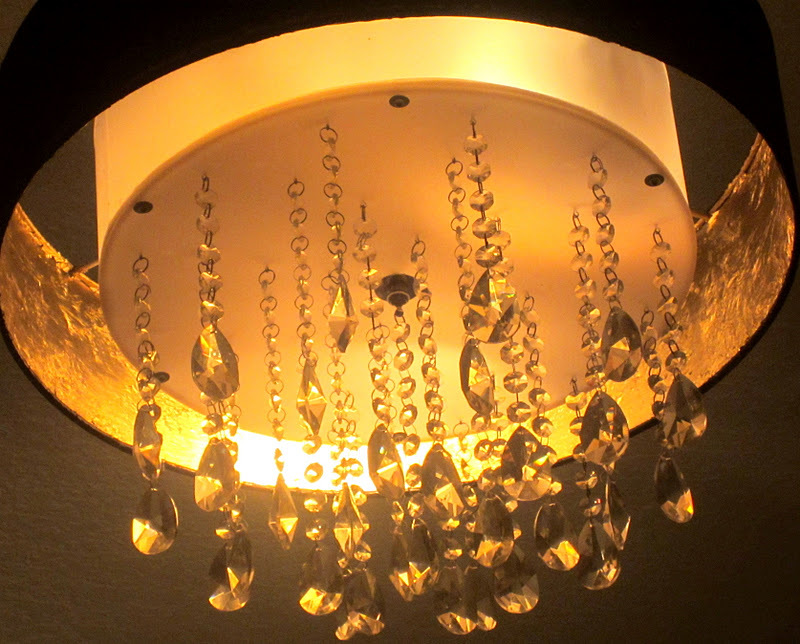 I also recommend doing this to the black exterior shade which I had to touch up with black paint thanks to my lack of gold leafing skills. * Also, make sure that you have a drop cloth as it does get a bit messy. 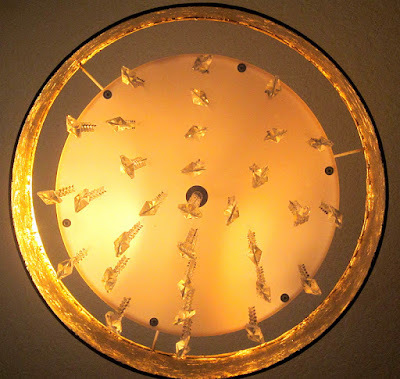 **Also, also, should you choose to do this I would recommend using a brush on adhesive which you let sit for a few second before applying the gold leaf. 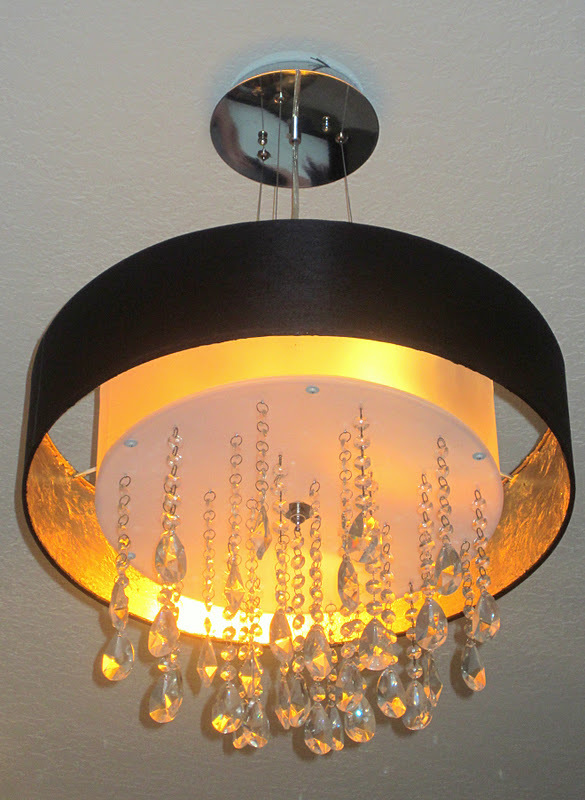 It is difficult to use the spray adhesive on this light due to the double drum shade. 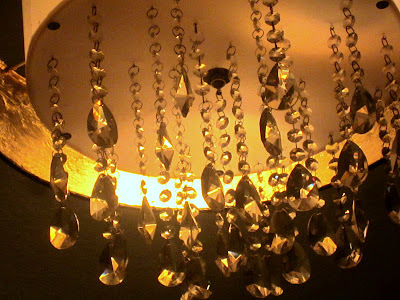 ***Also, also, also, remember my post from the West Elm Capiz chandelier where I added extra crystals from another old chandelier I had here ? Well, I did it again with those same crystals and beefed up my new light taking the length longer on each strand. It made a significant difference. 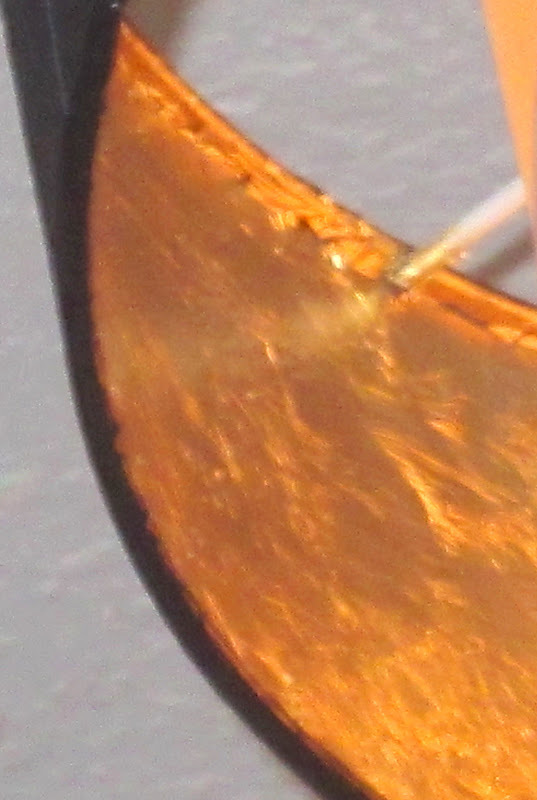 The rest was simply taking the time to attach the gold leaf in sheets one by one. They are very thin and tear very easy. On the package it says to use wax paper and rub it over the sheets which then should stick to your wax paper making application easy-peasy. NOT!!! They don't stick and instead had to be applied by hand which either got them stuck to my fingers thanks to the spray adhesive or they tore in to tiny little pieces. There is an up side to this. It really doesn't matter because you can layer upon layer the gold leaf covering any mishaps, and you can also fill in any gaps with the gold spray paint. Use this sparingly, but for slight errors it works well to cover the interior drum shade should the gold leaf be missing or bubbled in any places, I also used it from time to time to paint the gold leafs on which worked pretty well especially when putting pieces on top of already placed gold leaf (mainly because my damn foam brush was sticky and no longer helped me in any way!). Well, whatever trials we went through to get this done (Robert helped me every step of the way, thanks babe). The light turned out extremely amazing. Here are the results with a very teeny tiny sneak peak of our bedroom. Note that these are done prior to some changes that are coming soon. Wow! I just love how it turned out! It looks so lovely, and almost looks exactly the same as the original. 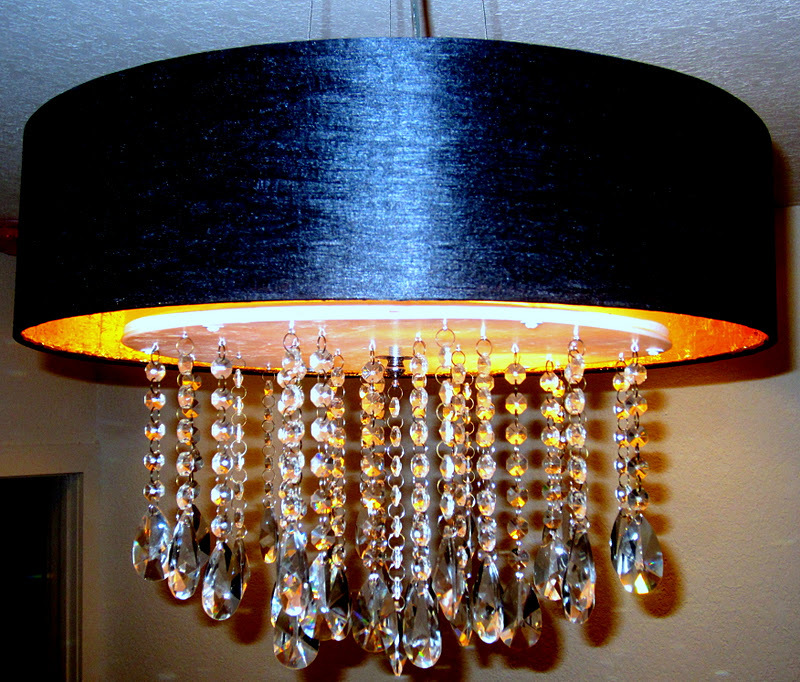 If you did not say that it’s only a DIY project, one would think that you actually bought it from the shop. Good job! So pretty. Thinking of putting over a poker table. Bright enough?